November 28, 1990. From Crandall Creek Bridge downstream to the north boundary of Section 13, T56N, R104W at Clarks Fork Canyon. Wild — 20.5; Total — 20.5 miles. 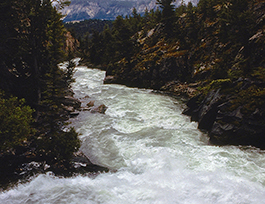 Nationally, this river segment's scenery is important due to its near proximity to the Chief Joseph State Scenic Byway and the Beartooth All American Highway. (All American Highways are the National Scenic Byway Program's elite designation; approximately six National Byways have qualified for this title.) Generally, these scenic highways follow the Clarks Fork of the Yellowstone River with high mountain peaks in the background and very little development or other human activities nearby. National and international visitors travel this scenic/recreation corridor on their way to Yellowstone National Park. The Clarks Fork possesses regionally and nationally important wildlife habitat for a diverse array of species including large carnivores and ungulates: grizzly bears, gray wolves, moose, elk, deer and other smaller species. The area offers world class fishing and hunting opportunities. Dramatic waterfalls exist within the inner gorges; few visitors trek the harsh and rugged terrain to access the river's gorges. Most access is by wildlife, volunteer and other lightly defined paths; otherwise access to the river shores is by overland orienteering. Much of the river bottom and/or gorges are inaccessible to traditional hikers. This river segment offers a high-quality wilderness experience without the formal "wilderness" designation. Neither special access permit regulations nor fees are in effect. Review the Shoshone National Forest travel management maps and brochures prior to planning any motorized vehicle access.